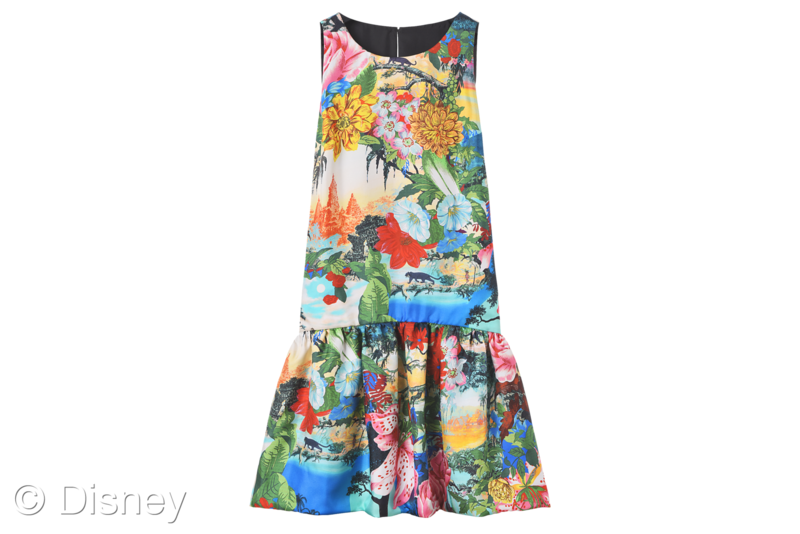 To celebrate the worldwide release of Walt Disney Studios’ “The Jungle Book,” KENZO is launching a collection of ready-to-wear that will be available exclusively at Bergdorf Goodman in the United States. 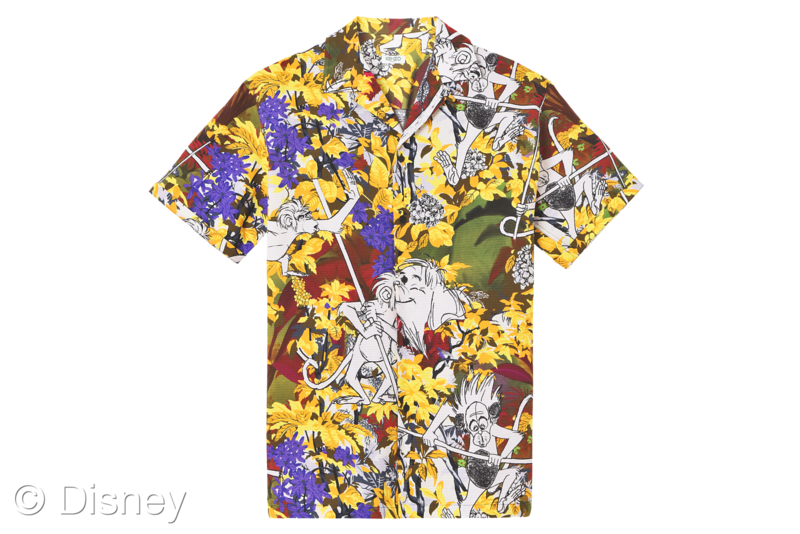 The limited edition collection of women’s and men’s ready-to-wear, influenced by the story’s classic animated characters, will be available starting April 1. In support of the launch, Bergdorf Goodman will also reveal two windows on April 5 inspired by the upcoming live action movie that debuts in U.S. theaters on April 15, 2016.
wolf suddenly came back to life in two abundant and richly colorful jungle scenarios. 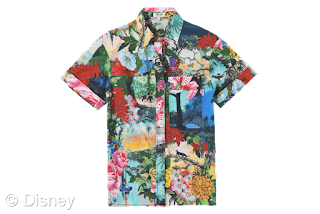 The prints will be featured on a women’s collection of silk and cotton summer shirts, dresses, jackets and tops and on the men’s collection which features light jackets, trousers, shorts and Hawaiian shirts. The collection draws inspiration from the French house’s historic first store founded in 1970 by Kenzo Takada. 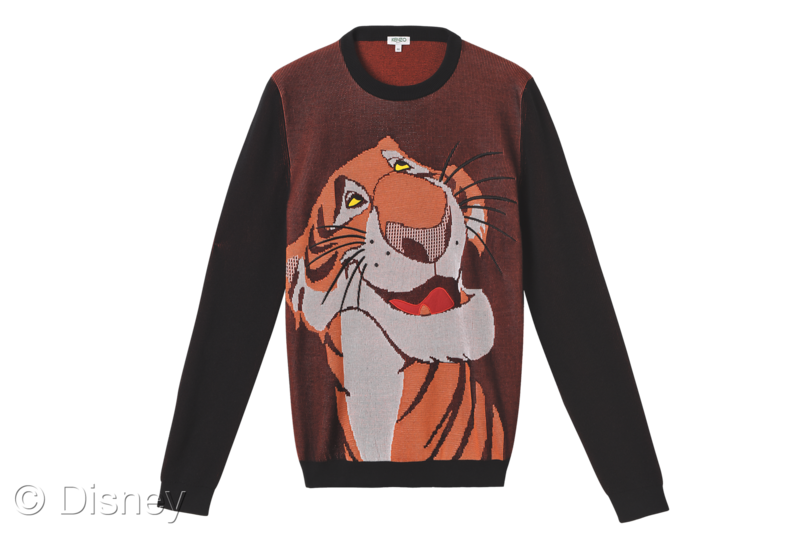 For this first collaboration with Disney, one of KENZO’s most renowned emblems has been cheekily usurped on a line of sweaters and tee-shirts by none other than the fearsome tiger, Shere Khan. Roaring his way onto the jersey pieces, Shere Khan makes his appearance on KENZO’s traditional tiger sweater symbolizing the natural fit between KENZO and Disney’s designs. The collection is rounded off with knitwear featuring Kaa the python and an intarsia Shere Khan pullover. “What we found most appealing for this project was to marry strong elements from The Jungle Book with details that we know as quintessential KENZO. There’s a way that everything comes together that is slightly familiar but also really fresh and exciting. The silhouettes we chose for the garments and accessories were inspired by the new direction Disney has taken with the live-action movie. There is a slight nod to jungle / safari elements (and even beautiful printed silk shorts directly inspired by Mowgli’s costume). Everything has been executed in a way that feels elevated and modern, which has been the collective goal of Disney and KENZO from the very beginning of this collaboration,” said Carol Lim & Humberto Leon. A New York landmark since 1901, Bergdorf Goodman represents the global pinnacle of style, service and modern luxury. With its rich history of showcasing leading and emerging designers, the iconic store at 5th Avenue and 58th Street—the crossroads of fashion—is a singular destination for discerning customers around the world. BG.com expands on Bergdorf Goodman’s heritage, showcasing coveted collections for men and women in an unparalleled online shopping experience. Bergdorf Goodman is part of Neiman Marcus Group. See the FULLSCREEN slideshow. CLICK HERE. KENZO was founded by Japanese designer, Kenzo Takada in Paris in 1970. With its colorful prints and declaration of freedom, KENZO shook up the couture codes of the time by irreverently breaking the rules. In 2011, Humberto Leon and Carol Lim took post as Co-Creative Directors. At the core of their approach, travel, culture and fashion manifest in all that they do. KENZO has become known for its groundbreaking collaborations with avant-garde artists, musicians, actors, and designers. Directed by Jon Favreau (“Chef,” “Iron Man,” “Elf”), based on Rudyard Kipling’s timeless stories and inspired by Disney’s classic animated film, “The Jungle Book” is an all-new live-action epic adventure about Mowgli (newcomer Neel Sethi), a man-cub who’s been raised by a family of wolves. But Mowgli finds he is no longer welcome in the jungle when fearsome tiger Shere Khan (voice of Idris Elba), who bears the scars of Man, promises to eliminate what he sees as a threat. Urged to abandon the only home he’s ever known, Mowgli embarks on a captivating journey of self-discovery, guided by panther-turned-stern mentor Bagheera (voice of Ben Kingsley), and the free-spirited bear Baloo (voice of Bill Murray). Along the way, Mowgli encounters jungle creatures who don’t exactly have his best interests at heart, including Kaa (voice of Scarlett Johannsson), a python whose seductive voice and gaze hypnotizes the man-cub, and the smooth-talking King Louie (voice of Christopher Walken), who tries to coerce Mowgli into giving up the secret to the elusive and deadly red flower: fire. The all-star cast also includes Lupita Nyong'o as the voice of the fiercely protective mother wolf Raksha, and Giancarlo Esposito as the voice of wolf pack’s alpha male Akela. “The Jungle Book” seamlessly blends live-action with photorealistic CGI animals and environments, using up-to-the-minute technology and storytelling techniques to immerse audiences in an enchanting and lush world. The wild adventure swings into theaters in 3D on April 15, 2016.